Definition at line 22 of file CLRenderPoint.h. Creates a new point with x,y and z set to 0.0. Definition at line 24 of file CLRenderPoint.cpp. Definition at line 35 of file CLRenderPoint.cpp. Creates a new point with the given ccordinates. Definition at line 70 of file CLRenderPoint.cpp. Definition at line 46 of file CLRenderPoint.cpp. Definition at line 89 of file CLRenderPoint.cpp. Adds the attributes for a render point object to the passed in. object. Definition at line 288 of file CLRenderPoint.cpp. 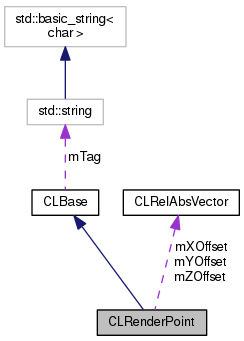 References mXOffset, mYOffset, mZOffset, and CLRelAbsVector::toSBML(). Referenced by toSBML(), and CLRenderCubicBezier::toSBML(). Definition at line 162 of file CLRenderPoint.cpp. Referenced by addToPath(), and moveToPoint(). Definition at line 216 of file CLRenderPoint.cpp. Definition at line 171 of file CLRenderPoint.cpp. Definition at line 225 of file CLRenderPoint.cpp. Definition at line 180 of file CLRenderPoint.cpp. Definition at line 234 of file CLRenderPoint.cpp. Sets the Z offset to 0.0. Definition at line 81 of file CLRenderPoint.cpp. Definition at line 54 of file CLRenderPoint.cpp. References mXOffset, mYOffset, and mZOffset. Definition at line 269 of file CLRenderPoint.cpp. Sets the coordinates to the given values. Definition at line 97 of file CLRenderPoint.cpp. References setXOffset(), setYOffset(), and setZOffset(). Definition at line 135 of file CLRenderPoint.cpp. Definition at line 108 of file CLRenderPoint.cpp. Definition at line 144 of file CLRenderPoint.cpp. Definition at line 117 of file CLRenderPoint.cpp. Definition at line 153 of file CLRenderPoint.cpp. Definition at line 126 of file CLRenderPoint.cpp. Referenced by initDefaults(), and setOffsets(). Definition at line 277 of file CLRenderPoint.cpp. Definition at line 189 of file CLRenderPoint.cpp. Referenced by CLLayoutRenderer::convert_to_absolute(), CLLayoutRenderer::draw_curve(), CLLayoutRenderer::draw_polygon(), getXOffset(), CCopasiXML::saveRenderPoint(), CLRenderCubicBezier::setBasePoint1(), CLRenderCubicBezier::setBasePoint2(), and setX(). Definition at line 243 of file CLRenderPoint.cpp. Definition at line 198 of file CLRenderPoint.cpp. Referenced by CLLayoutRenderer::convert_to_absolute(), CLLayoutRenderer::draw_curve(), CLLayoutRenderer::draw_polygon(), getYOffset(), CCopasiXML::saveRenderPoint(), CLRenderCubicBezier::setBasePoint1(), CLRenderCubicBezier::setBasePoint2(), and setY(). Definition at line 252 of file CLRenderPoint.cpp. Definition at line 207 of file CLRenderPoint.cpp. 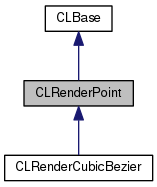 Referenced by CLLayoutRenderer::convert_to_absolute(), CLLayoutRenderer::draw_curve(), CLLayoutRenderer::draw_polygon(), getZOffset(), CCopasiXML::saveRenderPoint(), CLRenderCubicBezier::setBasePoint1(), CLRenderCubicBezier::setBasePoint2(), and setZ(). Definition at line 261 of file CLRenderPoint.cpp. Definition at line 26 of file CLRenderPoint.h. Referenced by addSBMLAttributes(), CLRenderCubicBezier::CLRenderCubicBezier(), operator=(), operator==(), setX(), and x(). Definition at line 27 of file CLRenderPoint.h. Referenced by addSBMLAttributes(), CLRenderCubicBezier::CLRenderCubicBezier(), operator=(), operator==(), setY(), and y(). Definition at line 28 of file CLRenderPoint.h. Referenced by addSBMLAttributes(), CLRenderCubicBezier::CLRenderCubicBezier(), operator=(), operator==(), setZ(), and z().